Should we build the Garden Bridge? I've been down to the intended site to decide for myself. I started at the northern end of the proposed span, at Temple. Very few people were using the station, which is fortunate because it's going to have to be closed for six months when construction gets underway, and this means nobody will be inconvenienced. 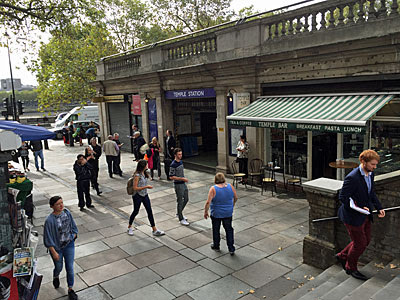 When the bridge finally opens the station will be immediately adjacent to a world-class tourist destination, thereby justifying its existence, and providing useful access to Somerset House and the Strand. 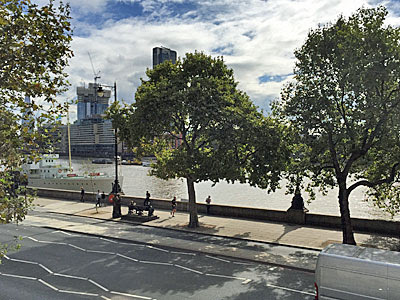 The area immediately around Temple station is an inaccessible backwater, adjacent only to the Thames Embankment, and would be greatly enhanced if tourists from the South Bank were able to reach it more easily. Also the East-West Cycle Superhighway passes this way, so cyclists won't need to go up to the new bridge to push their bikes across the river, and £30m of transport funding won't have been wasted. At the moment the immediate locality can only support a small independent cafe, an Australian-themed bar and two stalls selling magazines and fruit. Although this makes it easy to buy a proper breakfast and a copy of Private Eye, modern visitors expect so much more, and the opportunity to introduce chain outlets selling mass-produced pastries should not be understated. Alongside in Temple Place is a Grade II listed Cabmen's Shelter, a small green hut opened in 1880, providing rest and sustenance for the taxi trade. This will have to move when the road is pedestrianised, shifting parking spaces for the cab trade into neighbouring Surrey Street, and with the added benefit that passers-by will then no longer be distracted by the offer of a freshly-fried bacon butty or toasted ham sandwich from the hatch for £2.50. Access to the Garden Bridge will be via lifts or stairs to an upper deck on top of Temple station. 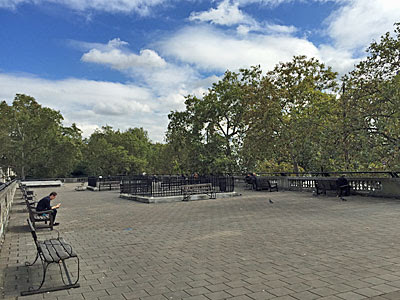 This upper deck already exists, and is a bland featureless expanse with only a table tennis table and more than thirty benches. Bad planning means that any view across the river is blocked by trees, so in summer there really is nothing to see, and heaven knows why quite so many people were up there. The view from the centre of the river will obviously be much better, there being no annoyingly massive trees in the way, because the deck of the bridge can't support substantial roots. 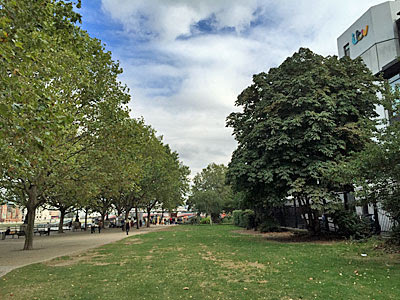 But the span will thrive with plantlife, which means nobody will miss the three plane trees on the Victoria Embankment which will have to be felled so that the Garden Bridge can carve through. From what I saw, the leaves are already turning yellow and starting to fall off, so the removal of these diseased trees can't come soon enough. A big gap exists between Waterloo Bridge and Blackfriars Bridge, a ghastly planning oversight which makes crossing the river very difficult. To reach Waterloo Bridge from Temple I had to walk for three and a half minutes, which is clearly beyond the ability of most people. More to the point I passed only forty trees along the way, suggesting that the new Garden Bridge will really bring this barren stretch of the Thames to life. The view from Waterloo Bridge is distinctly substandard, with some domed cathedral in the background, and a big watery space where the Garden Bridge ought to be. 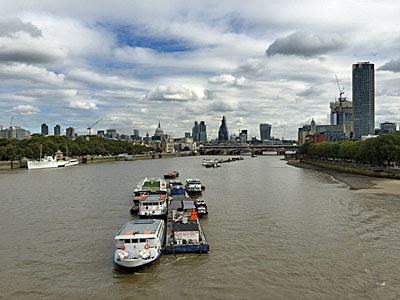 Also there's no vegetation on Waterloo Bridge, only an awful lot of traffic, and none of the deck is sponsored. Especially confusing are the rules which mean the bridge is permanently accessible to the public and not sealed off overnight, nor watched over by private security guards, nor closed twelve days a year for jollies. The South Bank is of course ridiculously busy, and urgently needs an additional exit to ease the pressure. 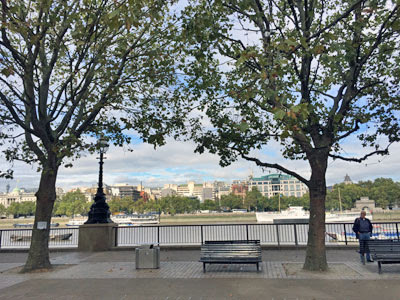 My trek back from Waterloo Bridge to the Garden Bridge's intended landing point took all of three minutes, so was a real slog, and involved walking past another forty trees. Again the riverside walkway isn't really suitable for cyclists, so preventing them from riding across a beautiful arboreal span will prove no hardship. The Garden Bridge clearly has to touch down somewhere, and a patch of lawn in front of ITV's South Bank studios is more ideal than most. Hardly anybody uses it, so a concrete and steel platform will be more welcome than the risk of treading in something unpleasant. A number of occasional coffee vans already utilise the embankment close by, and IBM's office block isn't exactly scenic, so the arrival of a grey structure with retail outlets won't look entirely out of place. 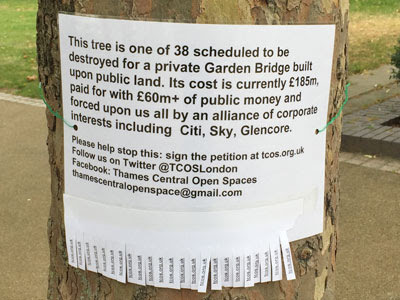 Somewhat disappointingly a pressure group has attached signs to each of the three dozen trees on the South Bank they say will be cut down to make way from the bridge and its associated podium. But they may be lying, and these mature specimens may somehow be left standing around the footprint of the new building, so long as the row of shops and cafes doesn't stretch out too far. What's for certain is that this invasive propaganda has an impact on those walking by, and many strike up a conversation about the integrity of the Garden Bridge as they pass. It's surprisingly hard to envisage the impact the Garden Bridge will have at its two endpoints, even given the vast amount of publicity this landmark project has had over the last few years. Only when the trucks arrive and the chainsaws start to whirr will the reality start to bite, and it'll then be a couple of years before the utopian crossing opens and the sponsors start to get their money's worth. The Lumley-Heatherwick Bridge, as it will surely be known, is a bold architectural project unique in its ability to divide public opinion. How astonishing it might be to walk across the Thames between horticultural specimens from around the world, pausing to enjoy the vistas opened up mid-river and paying heed to all necessary bye-laws. Tourists will flock to London to see it, two vibrant cultural districts will be linked, and an ever-changing seasonal landscape will be unlocked each day at six. But how can the project's questionable funding be justified, and should we be encouraging the privatisation of public space, and wouldn't any bridge be better located elsewhere? Let's hope this folly is never built.